I once thought it should be described as a "ping pong ball with wings." But today as I tried to do some quick sketches of it from the kitchen as it flitted around our Swiss Stone Pine and the suet on the clothes line pole I realized that "ppbww" was not quite right. The Ruby-Crowned Kinglet, which has been hanging around our backyard for much of the last three weeks, is just too active to have a name that doesn't include some sense of its hyperactivity. As I tried to sketch it I realized it was like a "flying hiccup." Though its body can seem to have the perfect roundness of a ping pong ball it's just too active to be accurately portrayed as something as stable as a perfect sphere. Instead it looks like it has incurable hiccups. Every time I put pen to paper it hiccupped again. I include some of my attempts to portray him between hiccups. When it comes to the impression that birds make on humans Pete Dunne seems to have some of the richest interpretations, especially in "Pete Dunne's Essential Field Guide Companion." So now that I've committed myself to "flying hiccup" let's see what Pete has to say. He refers to it as a "tiny, compact, hyperactive, and undistinguished bird..." Hmm. I guess he doesn't like it -- undistinguished! Oh well, not as much color in his description as I'd hoped for. Nonetheless he does note its hyperactivity. As I've mentioned elsewhere I'm sure this blog will show an underlying bias against doing artwork based on photos rather than from life, even in my own work. I think my experience with the Ruby-Crowned Kinglet shows why. Though I've taken some photos of this kinglet and could use them as the basis of a drawing or watercolor he would be perfectly still in the photo and most likely in the art. His hyperactivity is lost once the camera snaps its momentary glimpse. In drawing from life however there is much more of an attempt to capture the hyperactivity. The drawings here don't do a very good job of that but I think they at least explain why I find it to be the preferred method. Since I do most of my paintings based on photos all I can say by way of excuse is that I hope I'm familiar enough with the birds in the photos I've taken that some memory of what they are like when experienced live still comes through in my artwork. The initial posts in this log were edited copies of an old web site where I kept some art and birding notes. This begins the first of the live posts. April 8, 2007. It didn't really seem like the best weather for birding, 40 degrees when we began and winds at 10-20. But my wife and I like to take a bird walk on most holidays, generally somewhere along the Wissahickon, so we decided to head out, though with very low expectations. Our first 30 minutes showed almost no birds, just a cold, wintry sky. But when we got down to Forbidden Drive along the Wissahickon we saw more pine warblers than we've ever seen in one place at once. There were at least 12-15 of them. Most were not more than 6-10 feet off the ground. Normally when we do see a large number they are high up in pines. At that height, and often against an overcast gray sky, it would be hard to even know that they are pine warblers if it weren't for their fairly distinctive song. But these were on the sand, on rocks, on low shrubs at eye-level. They ranged in color from nearly gray to the brightest yellow. And most were singing so it was a great opportunity to match bird and song. As we adjusted to them we also found at least two palm warblers, at least one yellow-rump, two or more golden-crowned kinglets, and two ruby-crowned kinglet. All were in the same area near the water. They were all our first sightings of that particular species for 2007, outside of the kinglets. We also saw two phoebes, first of 2007, along with a couple of wood ducks, many robins, two downies and some other more usual birds. It maybe a cliche to say this, but you just never know what you might see when out birding, even on the most uninviting days. Sunday,12.03.06 -- The normal early winter birds have been in backyard and at Manayunk Canal in a short walk we took there today. Downy woodpeckers at both places as well as many Carolina wrens. Only one or two here but at least two or three at the canal. We still haven't had a hard freeze but one is predicted this week. Once we get one we should start seeing Sharpies in the backyard and maybe some surprises. Sunday,11.05.06, and the chance for another walk at the Wissahickon. It's hard to believe that you're in the middle of a city as large as Philadelphia once you start walking along the Wissahickon. We had no luck sighting an osprey, which we'd seen in our last two visits over the previous three weeks. Today's big surprise was at least two Blue-Headed Vireos. Though they are always one of the earliest spring migrants neither of us had seen them so late before in fall. Is this just us or are they really later this year? Until I run into someone who knows more than I about the timing of Wissahickon migrants I can only say: ask me about this next year. On Sunday,10.29.06, my wife and I decided to try our birding luck at the Wissahickon once again. Two weeks previously we'd seen an osprey there, the first she had seen there and only the second I'd ever seen. Though we had heard vague rumors of ospreys being seen there we'd never seen any. My only previous sighting was the day after the 2004 presidential election, when I was out trying to walk the results off. I was at Kitchen's Lane bridge when I heard a commotion to my right and saw an osprey rise up out of the water with a fish in his talons, fly over the bridge and then course up the Wissahickon. I've since read on the Friends of the Wissahickon web page that ospreys are sometimes seen there during fall migration but it sure was a shock at the time. In any case we hadn't walked far before we found another one. I suppose it's also possible that it was the one from two weeks previous and he'd just been hanging out. The location was more or less the same but I really don't know if it was the same one or not. And he didn't stick around long enough to do much in the way of sketches. The one on this page are from this sighting. (Another post copied from Birding and Drawing notes website.) There are about five pages to transfer. Once that occurs I'll only include new posts here. On Sunday,10.15.06, my wife and I decided to take a short walk at the Wissahickon near Monastery Ave. It had been cool for last couple of days so we thought we might see a few migrants. That we did. In fact we saw far more than we ever would have expected, including what are probably both the biggest and smallest birds that you're likely to see at the Wissahickon. The biggest surprise was an osprey. We first saw him in a tree about 30' high on the other side of Wissahickon creek. We only walked about 1/2 mile down Forbidden Drive in our walk but we must have seen him at least 3 times, each time down another few hundred yards or so. We'd never noticed his full-throated whistle before. It seemed so different than most raptors, but it did alert us that he was around. Though I had heard rumors of ospreys at the Wissahickon and though we'd seen them in flight at nearby Militia Hill and Morris Arboretum wetlands this was only the second one we'd seen here. The first was a brief look as he flew off with a fish in his talons two years ago. All in all this may have been the closest look we've ever had at this handsome raptor. I'd guess the osprey is the largest bird that is likely to be seen at the Wissahickon. But barring a possible (?) Bald Eagle we also saw all the other candidates for largest bird of the Wissahickon on Sunday: a few Red-Tailed hawks, a Great Blue Heron whose pearly, gray back was almost indistinguishable from the log at whose base he hunched, and two, yes TWO, pileated woodpeckers. I've only seen two pileateds at same time one other time at Wissahickon. That was 4-6 years ago when I spotted one in binoculars but also heard another calling. By following the gaze of the first one I was able to spot the second one a few hundred yards away. But this time they were more cooperative, often ending up in the same tree only yards away from Forbidden Drive. From what we could see they were either both females or immatures. We never could see any of the red near the throat of the male. But sometimes it is hard to see. In either case it was a real treat to watch them for 15 minutes or more, both on trees and in flight. There is always something slightly primordial about a pileated in flight, especially a close pileated in flight. That takes care of the largest and you can probably guess the smallest: kinglets. We must have seen 5-10 of each species some extremely close and fearless. At one point I stretched out my hand to see if one of the Ruby-Crowneds would jump the additional foot from the nearby branch to land on the coffee cup I carried. The answer is no. I didn't expect so but he was so close I did wonder. Kinglets are always a treat to see, except for those moments when you're searching for some rare warbler, only to find that it's a kinglet. That wasn't the case this time. It would have been nice to see warblers, but we were perfectly happy with such close looks at so many kinglets. Rounding out the day was a Blue-Headed Vireo and one or two Black-Throated Blue warblers along with a few of the usual Wissahickon birds. So there it is: the big, the small and the blue of it. We thought we might see a few unusual birds because of the cooler weather but we never expected such a bonanza. Today I copied over most of my original Birding and Drawing Notes site. That site began for a number of reasons: I realized I had a free hosting site available to me; I wanted to have a place to show small sketches that I'd done; I wanted to be able to publish some writings on art, birding, and possibly programming; and it seemed like a good opportunity to explore a different programming language than the one I use on my primary web site. The intent was that it should be analogous to a sketchbook or notebook. At the time it seemed that this was a better alternative than a blog, mainly because I didn't want to be burdened by the constant updates expected of a blog. And I still don't. But I have also realized that I don't have time to create my own web page every time that I want to post a sketch or a few thoughts. I already spend too much time updating my main site. And I never found time to investigate that new programming language. For quick postings a blog, at least in theory, seems easier. Time will soon tell. I don't want to be tied down to timely updates. Though personal computers and the web have brought a wealth of tools to individuals they can also become harsh taskmasters. Do I want to spend time birding, sketching or whatever or would I rather cut down on some of that time so I can update a database with my sightings, possibly write about them, scan and edit the sketches, and publish then on the web? My preference is to use the pc and the web only when I feel like it, not every time something of marginal interest occurs in my life. One undercurrent that you'll find is an apology for drawing and painting from photographs rather than from life. I have no doubt that much is lost in any art work that is derived from photographs. 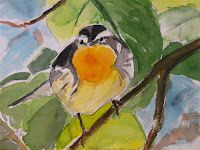 But sometimes it's just very difficult to sketch, let alone, paint a fleeing Blackburnian warbler. It's often a choice between just viewing such a striking bird, losing that moment of appreciation and replacing it with a hurried attempt to photograph it, or finally, making a desperate attempt to get it down on paper. Most often I'm happy just to look. More rarely I'll try to get some photos, which will eventually be the source for drawings/paintings(see top right). Even more rarely I'll try to draw or paint it on the spot. The sense of immediacy that comes out of most drawings done from life is hard to replace. On the other hand it's often difficult to get much down on paper in the few seconds that I might view some birds each year as they pass through on their migratory way. As time goes on I hope to show more work from life. One other undercurrent is the Wissahickon Creek area of Philadelphia. Much of my birding and other outdoor activity takes place there or near to there, the Wissahickon itself, Carpenter's Woods, Morris Arboretum, Schuylkill Valley Nature Center.